Attracting MOURNING DOVES to Bird Feeders - Which Feeder is Best? Attracting Mourning Doves, sometimes called just Doves or Rock Pigeons, etc..., is an easy activity. Doves are year-round residents throughout most of the US and summer in southern Canada as well. It is a popular bird found at most feeding stations, typically in small flocks. Getting doves to feed at a station is simple and they are regulars at most all. Getting them to feed FROM a feeder is another story though. Not that they won't use a feeder but their size typically restricts them from landing on or even setting on one. We are asked two questions here regarding doves. First is: "How do I deter doves from my yard?" I personally love the doves and cannot figure out why people don't want them and that's a whole different article. The other and more popular question are: "How do I attract the mourning dove?" Doves are a natural ground feeding bird. Watch them for a short while and you will see they are rather content milling around on the ground picking up whatever gets kicked from your feeders. After talking to a customer for a few minutes, we find that most people are actually asking us how to get doves ON a feeder or what is the best feeder for a dove? That's a different story altogether. Doves are a large and clumsy bird. Having one land on your feeder is like having a jumbo jet land on a seagoing aircraft carrier. Matter of fact, each scenario looks similar to one another in their landing patterns. Like an aeroplane, a dove tends to glide into a feeder wavering left and right, up and down. So, if you desire the idea of having doves ON your feeders, you will need large feeders. Our largest feeder is actually named the Mourning Dove Series and for good reason. It's BIG in all ways. The extra room provided by a large hopper feeder or a medium to large fly-through will provide enough room for a dove to navigate its way onto one. We also offer what is known as a seed catcher tray. It's a large flat platform feeder that is designed to set underneath pole mounted feeders and adds a great deal or "real estate" to any feeding station. If you seriously want doves to feed on your feeder, I recommend setting up a medium to a large fly-through feeder. It allows for a good quantity of seed and gives the doves plenty of landing room. If you desire a hopper style feeder, pick the largest one your budget will allow and look for a feeder with a base platform having extra room around the hopper. The more area you offer the dove, the more successful it will be in landing. Adding a seed catcher tray will positively contribute to your success rate due to its oversized "landing pad." Once your doves are upon the feeder, they will be more than happy to hang around for long periods of time. One other thing. When you set up a dove feeder, set up a pole or post mounted one. Hanging feeders tend to swing in the breeze and make a difficult landing situation for the bird, especially a hopper style feeder since the landing area is much smaller. A hanging feeder will also swing more wildly when the large and heavy bird makes its landing. 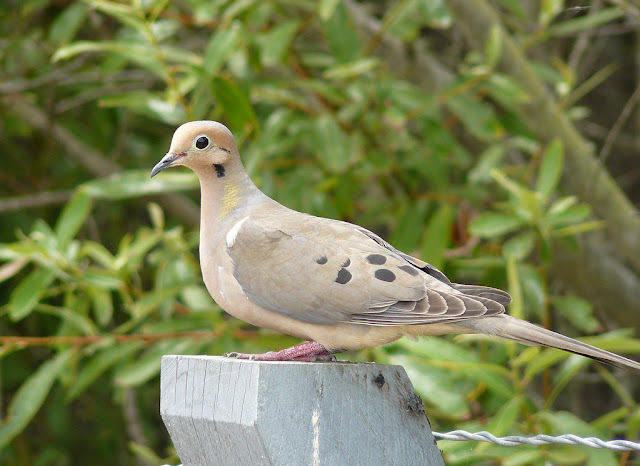 Feeding mourning doves will add a great deal of joy to your birding world. They typically stay around for long periods of time allowing you to enjoy them more than most other birds. They will still feed on the ground no matter what you do. So in effect, they will be acting as little house cleaners too. The less seed on the ground, the less you have to pick up. I highly recommend catering to this great bird and in doing so, you will be reward with countless hours of enjoyment from their subtle beauty and easy going calm mannerisms. Peter Hurley has been an active nature lover and wildlife enthusiast his entire life and is the owner of The Hurley-Byrd Bird Feeder Co. His vast experience with nature and wildlife has led his company to produce some of the finest bird, deer and wildlife feeders in the world.